Hardening is the process of growth of strength. This is often confused with 'setting' but setting and hardening are not the same. Setting is the stiffening of the concrete after it has been placed. Hardening may continue for weeks or months after the concrete has been mixed and placed. Voids in concrete can be filled with air or with water. Broadly speaking, the more porous the concrete, the weaker it will be. Probably the most important source of porosity in concrete is the ratio of water to cement in the mix, known as the 'water to cement' ratio. This is defined as the mass of water divided by the mass of cement in a mix. The water/cement ratio may be abbreviated to 'w/c ratio' or just 'w/c'. In mixes where the w/c is greater than approximately 0.4, all the cement can, react with water to form cement hydration products. At higher w/c ratios it follows that the space occupied by the additional water above w/c = 0.4 will remain as pore space filled with water, or with air if the concrete dries out. 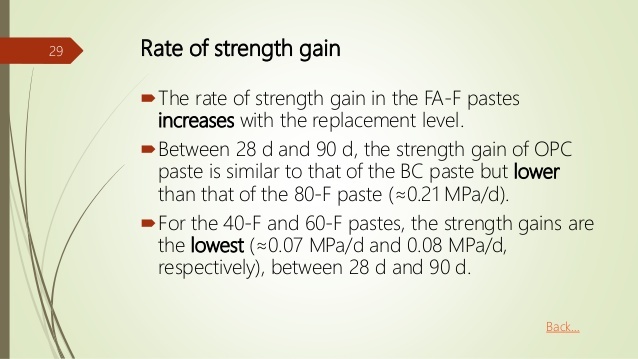 Consequently, as the w/c ratio increases, the porosity of the cement paste in the concrete also increases. As the porosity increases, the compressive strength of the concrete will decrease. If the aggregate in concrete is weak, the concrete will also be weak. Rocks with low strength, such as chalk, are clearly unsuitable for use as aggregate. The compactness of the bond between the paste and the aggregate is critical. If there is no bond, the aggregate effectively represents a void & voids are a source of weakness in concrete. Alite is the most reactive cement mineral that contributes significantly to concrete strength. More Alite should give better early strengths ('early' means up to about 7 days). Some physical parameters of cement also play role in strength gain of concrete like Cement surface area and particle size distribution. Fineness is often expressed in terms of total particle surface area. More fine is cement; greater will be its hydration rate. Particle size distribution is also very important prospect in strength gain of concrete. Cement with very finely-ground gypsum and clinker particles results in slower hydration. 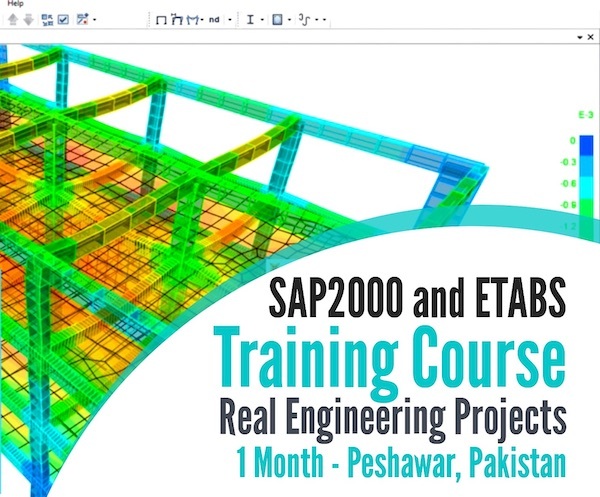 To determine the rate of gain of strength of concrete, there is a need to select period shorter than 28 day, as 28 day is considered to be the reference time. In concrete practice, it is accepted that after 28 days concrete usually gains most of its strength. 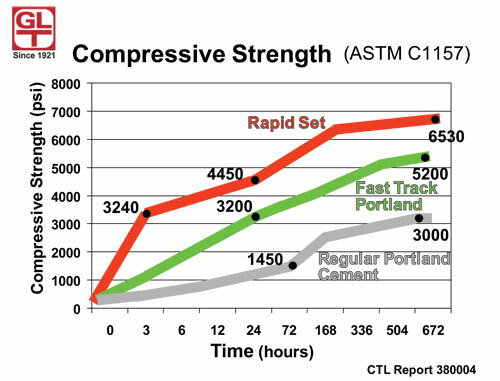 Strength determined at an early stage say after 7th day of placing of concrete can be compared to strength determined after 28 days, which is considered to be the reference time. 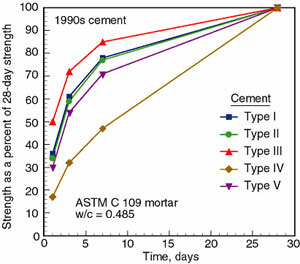 In this way, rate of gain of strength of concrete can be determined.